Researchers at IBM have demonstrated a prototype optical chip that can transmit up to 1 terabit of data per second. Engineers have managed to build the Holey Optochip using components that are readily available today, meaning the chip could be manufactured in high volumes for commercial implementation sooner rather than later. The Holey Optochip was envisioned as part of IBM’s continued efforts to use light rather than electrons over wires to transmit massive amounts of data. 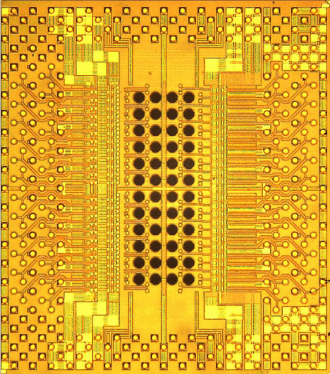 The chip was created by taking a standard 90nm CMOS chip and drilling 48 tiny holes through the back of it. This allows access for 24 receiver and 24 transmitter channels, each capable of moving 20 gigabits of data per second. The end product can move 960 gigabits (nearly 1 terabit) of data per second, speeds that could transfer 30,000 HD movies each minute. A single chip could transfer the entire Library of Congress in just one hour - all of this from a chip that is one-eighth the size of a dime and is powered by less than 5 watts of electricity. Revisions are already in the works that increase channel output to 25 gigabits per second which would produce a chip capable of 1.2 terabits per second. IBM Optical Links Group manager Clint Schow told Ars Technica that IBM won’t be mass-producing the chips but they could become commercially available within a year or two for between $100 and $200 each. IBM will be presenting the Holey Optochip at the Optical Fiber Communications Conference in Los Angeles today.